This year’s Warsaw Book Fair schedule was filled with interesting events – from meeting with authors, to lectures, and to attractions prepared especially for children. 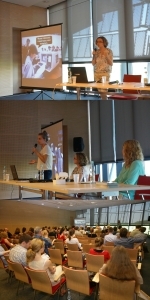 We are proud that Macadamia was also one of the active participants – on May 23rd, as announced in the previous note, we held our first seminar addressed to novice writers. The first speaker, Magda, was talking about basic rules that should be obeyed when addressing a publishing house with a manuscript. Later, Kamila summarized most crucial elements which simply must be included in a good publishing agreement. And finally, Beata Wawryniuk of PR Education explained the different possibilities that modern book market has to offer for writers. It was the first – but hopefully not last! – event of that kind organized at the Fair. To our utter joy, the number of participants was quite impressive, and the Q&A part after the presentation exceeded all our expectations. Thank you so much for coming and for the discussion! We truly believe this is only the beginning – the undeniable success of this year’s edition only confirms our belief that there is a great demand for that type of meetings. P.S. 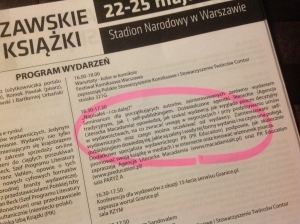 Our special thanks goes out to Beata Wawryniuk of PR Education, and Mr. Tadeusz Górny of the Warsaw Book Fair.